Survivor has proved its longevity in the reality television genre. The CBS show that tests participants’ ability to outplay, outwit and outlast their opponents has been entertaining audiences for years. The current season, debuting on February 17, puts a classic question to the test – which is superior, brains brawn or beauty. 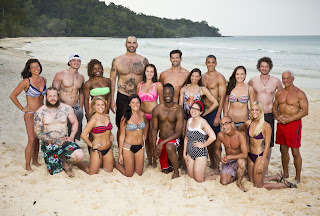 Survivor Kaoh Rong premiers with a 90 minute episode on Wednesday, February 19 at 8 p.m. EST. This season, the 32nd, will keep viewers returning for the next unbelievable twists and turns. From ear burrowing parasites to the fan favorite blindside, this season of Survivor will surely delight fans. Since the show is the longest running reality competition series, Survivor has proven loyalty with its fans. Now the original Survivor fans are sharing their enthusiasm for the show with their children. The Wednesday night episodes are becoming family television night as both young and old cheer for their favorite contestants. Don’t miss the premier of the 32nd season of Survivor Kaoh Rong, Brains vs. Brawn vs. Beauty on CBS Wednesday, February 17 at 8 p.m. EST. Disclosure: I am a member of the Role Mommy Writers campaign. This post was sponsored by that network.